A Natural Source of Acetogenins and Vitamins with Natural Blend of Graviola, Mangosteen, Nopal and Aloe Vera. BUY TWO BOTTLES FREE SHIPPING! GRAVIOLA, also known as Soursop, is a green, spikey fruit that comes from the warmest tropical areas in South America and some of the Caribbean islands. What is GRAVIOLA Used For? Known as one of the finest traditional medicines available on the planet, GRAVIOLA JUICE is derived from an all-natural fruit that has been used for centuries to help eliminate stomach and bowel discomforts, kill harmful bacteria, viruses and parasites, increase lactation in women and help maintain healthy glucose levels. Studies also suggest that Acetogenins, the active constituents of GRAVIOLA JUICE, can support healthy cell growth and function, including proper serotonin production. GRAVIOLA JUICE is (and has been) a great supplement to help maintain a positive mood by calming nerves and lowering blood pressure, increase energy and enhance metabolism. Graviola, also known as Brazilian paw paw, is a greenish-yellow fruit on the outside with white flesh on the inside. However, the most therapeutic parts of the graviola tree are the leaves, bark, roots and seeds, which have been used by the indigenous peoples of the Amazon to treat various illnesses for thousands of years. As a natural immunity booster, graviola has been used to kill parasites, ameliorate liver problems, reduce fevers, and treat colds and the flu. 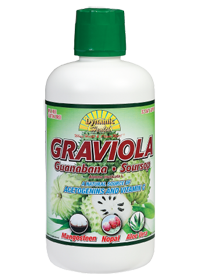 Scientists have studied graviola since the 1940s and most research has been centered around annonaceous acetogenins, a group of natural compounds that have anti-tumorous properties – meaning they fight various types of cancer cells – and thus are of great support to the immune system. A Natural Source of Acetogenins and Vitamin C.
The fruit of the Graviola ,Guanabana ,Soursop (Annona muricata L.) tree has been treasured for thousands of years by the inhabitants of the Caribbean, Central America and select tropical regions throughout the world. The warm climate and nutrient rich soil guarantee nearly perfect conditions for these trees to blossom. The white flesh of the green prickly fruit is juicy and aromatic. Our antioxidant rich elixir offers the synergy of Graviola, Organic Mangosteen, Aloe Vera and Nopal to promote healthy living. Nopal is regarded worldwide as a nutritional goldmine and its cactus "pad" has been used as a daily food. Aloe Vera has been used for centuries to promote healthy living. Mangosteen is grown in Asia and known as the "Queen of Fruits". It is a natural source of Xanthones and is traditionally used to promote healthy living. Directions: Take 2 tablespoons (1-3 fl oz) daily on an empty stomach, preferably in the morning, or as directed by your health care professional. Other Ingredients: Filtered water (sufficiant to reconstitute), graviola fruit puree (from annona muricata L.plant) graviola leaf extract, organic mangosteen puree (from whole garcinia mangostana L.) organic aloe vera (A. barbadensis mill) (whole leaf), nopal (pad and prickly pear) (opuntia ficus-indica), organic certified guar gum (from the seed of the guar plant Cyamopsis tetragonoloba L.) pectin (citrus), organic certified stevia, citric acid, ascorbic acid, potassium sorbate (as an oxygen inhibitor) and natural flavor. PLEASE NOTE: NO CLAIMS ARE MADE OR IMPLIED THAT GRAVIOLA OR ANY OTHER PRODUCT ON OUR WEB SITE CAN DIAGNOSE, CURE, MITIGATE, TREAT OR PREVENT CANCER OR ANY OTHER DISEASE. ALL INFORMATION IS PRESENTED FOR YOUR INFORMATION ONLY AND NOT MEANT TO BE MEDICAL ADVICE. WE DO NOT PRESENT GRAVIOLA AS A DRUG. Place your order for Graviola on line or call us toll free at 1-877-291-8263. Before taking a dietary supplement, consult a doctor or other health care provider especially if you have a disease or medical condition, take any medications are pregnant or nursing or are planning to have an operation. "GRAVIOLA" HEALING HERB OF THE AMAZON.